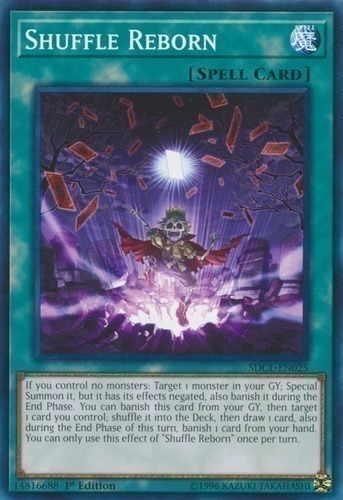 Text If you control no monsters: Target 1 monster in your GY; Special Summon it, but it has its effects negated, also banish it during the End Phase. You can banish this card from your GY, then target 1 card you control; shuffle it into the Deck, then draw 1 card, also during the End Phase of this turn, banish 1 card from your hand. You can only use this effect of "Shuffle Reborn" once per turn.